NEW AUGUST 2016. 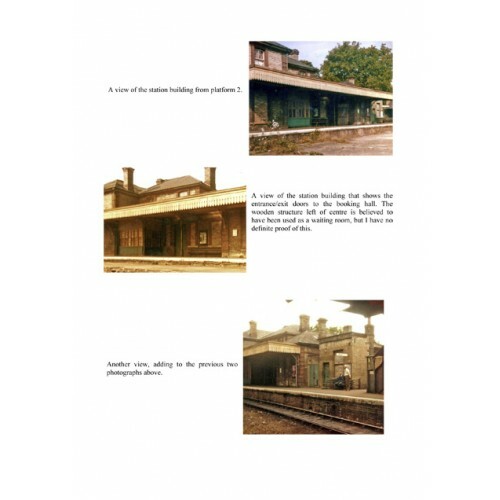 A set of 33 snapshots, three of them in black and white and the others in colour, recording the railway buildings at Sudbury from around 1960 to 1985. Two of them show what remained of the original terminus building of 1849 (since demolished), which was replaced by the current station in 1865. What each picture may lack in sharpness is made up for by its rarity and interest. The file starts with an introduction and also includes a single-page map of the station and its approaches to illustrate the locations of the photographs. The black and white pictures date from about 1960 and give glimpses of Sudbury station and goods shed still fully operational. The others, on colour prints, illustrate its decay during the 1970s and 1980s as it became an unstaffed terminus. They were all taken by our member Richard Harper (414). He provided the captions to the photos. He has also made available some scale drawings of Sudbury station which prospective modellers might be glad of. For those you will need to get D34.CD. That CD also contains these same photographs and a bit more information about the history of the station. You may therefore select the CD. Alternatively, if the photos are your main interest you are advised to opt for this file. It is cheaper, there is no postage to pay and it will be available to download as soon as payment has been made. You go to your account and click on ‘Downloads’. New customers create an account as they place their order.